The index opened weak and stayed weak for the entire session of trade to close weak at 8723.05, huge loss of 108.50 points. The broader market was weak with 524 advances to 1100 declines. Range stays at 8500-9000. 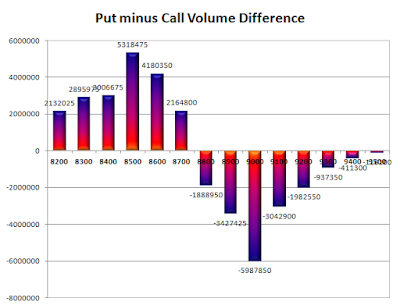 Call option 8700-8800 added 20.40 lacs OI with profit booking at 9000 and above strike prices. 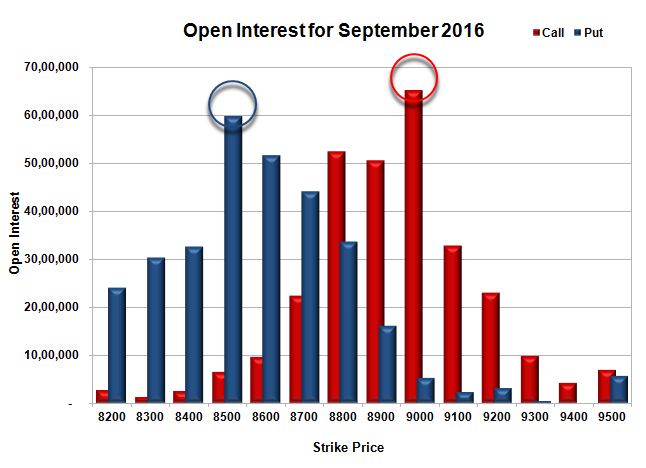 Put option 8200 added 0.24 lacs OI with short covering at 8800 and above strike prices. 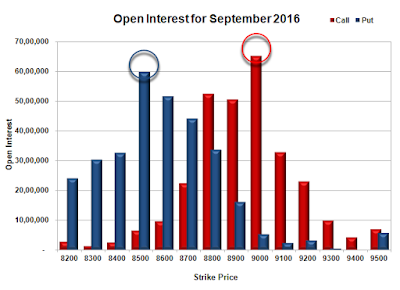 Nifty Open Interest is at 2,49,91,875 down by 63,49,275, whereas Oct series added 56.22 lacs with decrease in price, mostly roll-over with huge long liquidation. Bank Nifty Open Interest is at 19,41,080 down by 2,95,160, whereas Oct series added 2.78 lacs with decrease in price, mostly roll-over with some long liquidation. FII’s sold huge 18603 contracts of Index Futures, which includes net 22536 contracts long liquidation and 3933 contracts short covering, with decrease in net OI by 26469 contracts, includes 114065 longs to 132668 shorts for the day. 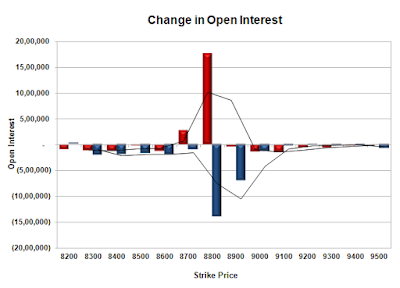 FII’s Index future open contract as on date is 382577 Longs to 70729 Shorts, Net long 311848 contracts. Initial support now at 8700, with OI of 44.14 lacs and below that at 8600 with OI of 51.60 lacs. 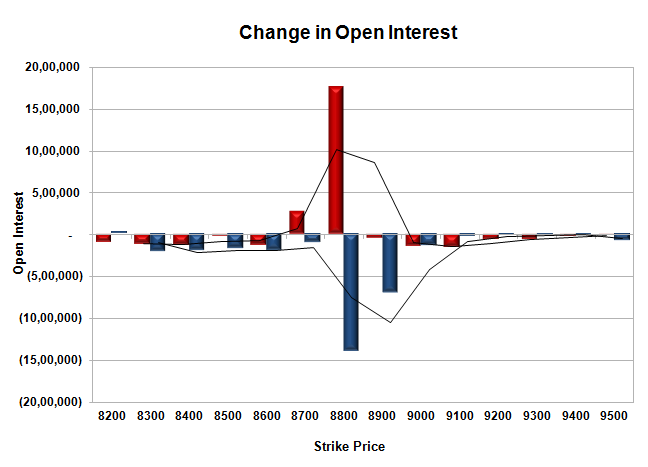 Initial resistance at 8800, with OI of 52.51 lacs and above that at 8900 with OI of 50.53 lacs. 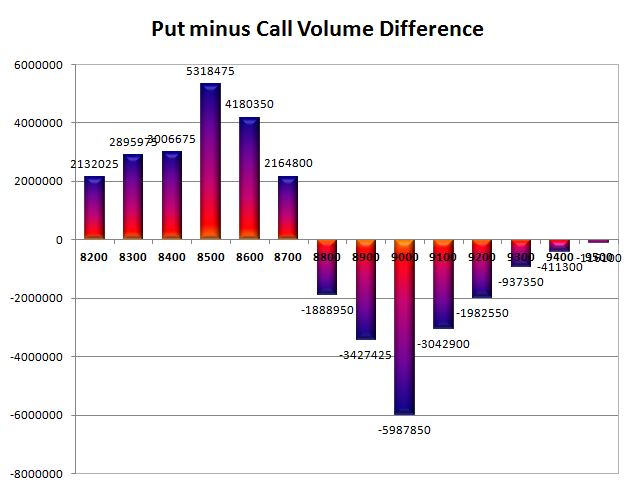 Day Range as per Option Table is 8685 - 8801 and as per VIX is 8657 - 8790 with 8749 as the Pivot.